Make sure you have the latest version of ONLYOFFICE Enterprise or Community Edition installed on your server. If not, install it or create a test account in the cloud. The end-to-end encryption is supported starting from version 5.2.3 of Document Server and version 9.6.4 of Community Server. Install the latest version of ONLYOFFICE Desktop Editors. Open the desktop editors settings and switch End-to-end encryption on. The corresponding tab will appear on the right. Switch to the End-to-end encryption tab. Create an account in the ONLYOFFICE blockchain network clicking the corresponding button and entering a password. Please note! Save your mnemonic phrase and a password in a safe place as it is the only way to unlock your account. Once the encryption is enabled, all your documents, as well as inputs, will be encrypted with AES-256. Switch to the Connect to cloud tab on the right. 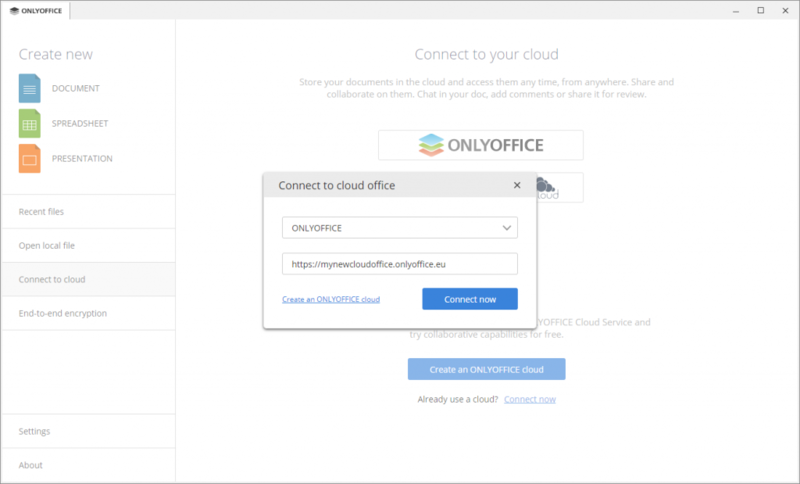 Click the ONLYOFFICE button and enter the URL of your cloud office. 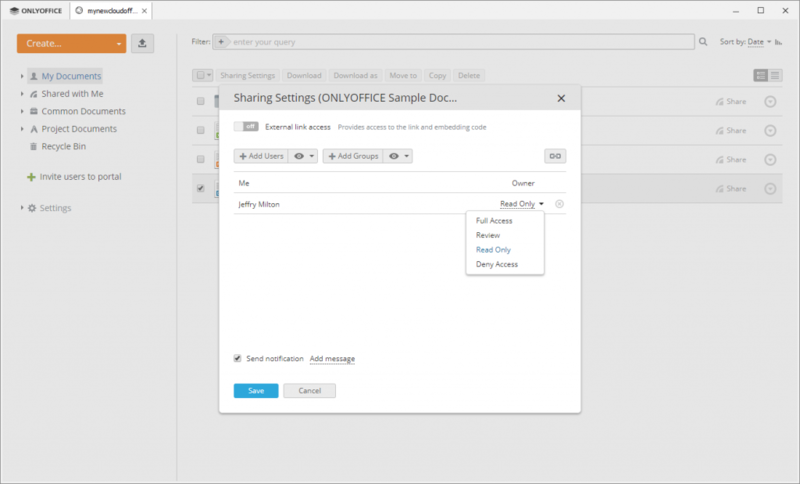 Currently, the end-to-end encrypted co-editing is available for ONLYOFFICE solution only. You can store the encrypted documents on ownCloud or Nextcloud, but not collaborate on them in real-time. Please note! 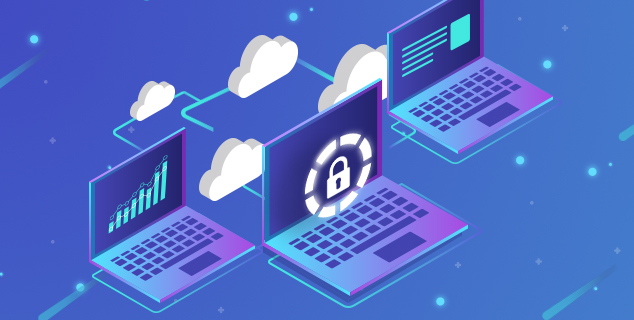 To co-edit encrypted documents in real time, all co-authors must be connected to the cloud through desktop editors with the end-to-end encryption enabled. To start co-authoring your document, just share it with your team providing access permissions. When you create a blockchain account, one private and public key pair is generated for you. When you connect to the cloud with the end-to-end encryption enabled for the first time, the public key is saved to the ONLYOFFICE database. When you save a document with the end-to-end encryption enabled, a 256-bit password is automatically generated to protect your document. This password, in turn, is encrypted using your public key and together with a UUID as a file name and the author blockchain account address is stored in the blockchain network. When one shares a document with you, your public key is used to encrypt the password, that is transferred via blockchain network and decrypted using your private key. When you start co-editing a document, all your inputs are encrypted as well, so that no one can see the changes you made if they have not appropriate access rights and don’t enable the end-to-end encryption. You don’t need to enter any passwords once the end-to-end encryption is enabled. Join us on GitHub to share your experience, discuss any issues, or make a suggestion.